The Congressional Gold Medal was presented collectively today to the voting rights marchers—known as foot soldiers—who participated in the Selma to Montgomery, Ala., voting rights marches of 1965. 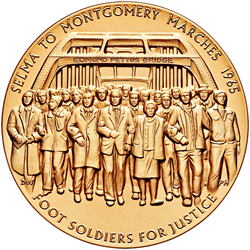 The Congressional Gold Medal was presented collectively today to the voting rights marchers—known as foot soldiers—who participated in the Selma to Montgomery, Ala., voting rights marches of 1965. The ceremony took place in Emancipation Hall of the U.S. Capitol Visitor Center. March 7, 2015, marked the 50th anniversary of the peaceful marches by civil rights demonstrators from all racial and economic backgrounds to protest the denial of voting rights to African-Americans. The first march, which left the Brown Chapel African Methodist Episcopal Church in an attempt to cross the Edmund Pettus Bridge, was unsuccessful. The day became known as Bloody Sunday because of the brutal resistance the protestors encountered. The second attempt to cross the bridge, known as Turnaround Tuesday, was halted because of concern for the protestors’ safety. Undeterred, the protestors attempted a third march from Selma to Montgomery which was successful, becoming a climactic event in the civil rights movement. The extraordinary bravery and sacrifice of these men and women brought national attention to the struggle for equal voting rights and served as the catalyst for Congress to pass the Voting Rights Act of 1965, which President Lyndon B. Johnson signed into law on Aug. 6, 1965. Designed and struck by the United States Mint, the medal’s obverse (heads) depicts foot soldiers crossing the Edmund Pettus Bridge on their 54-mile journey from Selma to Montgomery. Inscriptions are "SELMA TO MONTGOMERY MARCHES 1965" and "FOOT SOLDIERS FOR JUSTICE." The obverse was designed by United States Mint Artistic Infusion Program (AIP) artist Donna Weaver and sculpted by United States Mint Sculptor-Engraver Phebe Hemphill. 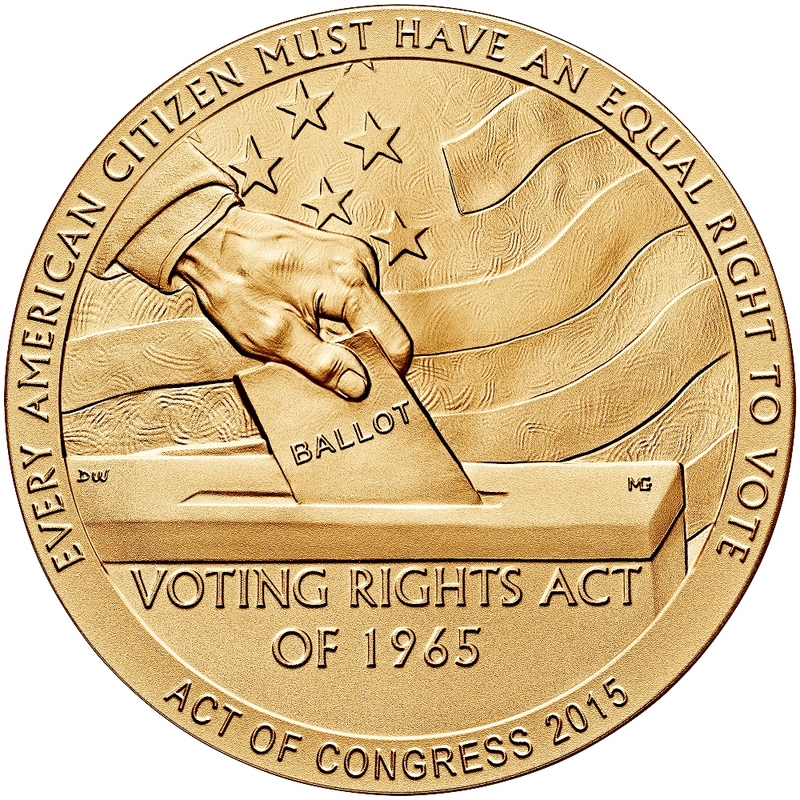 The medal’s reverse (tails) design commemorates the Voting Rights Act of 1965. The design features a hand, a voting ballot box, the quote "EVERY AMERICAN CITIZEN MUST HAVE AN EQUAL RIGHT TO VOTE" from President Lyndon B. Johnson’s voting rights speech to Congress, "VOTING RIGHTS ACT OF 1965," and "ACT OF CONGRESS 2015." The reverse was also designed by Weaver and sculpted by United States Mint Sculptor-Engraver Michael Gaudioso. Public Law 114-5, which awards the Congressional Gold Medal to the Foot Soldiers who participated in Bloody Sunday, Turnaround Tuesday, or the final Selma to Montgomery Voting Rights March in March of 1965, also authorizes the bureau to strike and sell bronze reproductions of the medal. The three-inch medal (product code 15MN), priced at $39.95, and the 1.5-inch medal (product code 15MP), priced at $6.95, will be available for purchase beginning today after 3 p.m. Eastern Time via the bureau’s online catalog at https://catalog.usmint.gov/ and at 1-800-USA-MINT (872-6468). Hearing- and speech-impaired customers with TTY equipment may call 1-888-321-MINT (6468). The United States Mint was created by Congress in 1792 and became part of the Department of the Treasury in 1873. It is the nation's sole manufacturer of legal tender coinage and is responsible for producing circulating coinage for the nation to conduct its trade and commerce. The United States Mint also produces numismatic products, including proof, uncirculated, and commemorative coins; Congressional Gold Medals; and silver and gold bullion coins. The United States Mint's numismatic programs are self-sustaining and operate at no cost to taxpayers. Digital images of the Foot Soldiers of the 1965 Selma to Montgomery Voting Rights Marches medals are available at http://www.usmint.gov/pressroom/?action=Photo. Information about the United States Mint is available at http://www.usmint.gov/about_the_mint/.